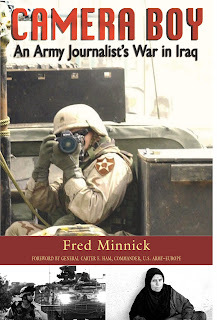 "Former Staff Sergeant Fred Minnick, a member of the best Public Affairs unit I have ever served with, has captured the essence of...what it was like to serve in northern Iraq in the critical year of 2004. Mostly, what shines through is an intense love of fellow soldiers and of the pride that comes from serving with an incredibly talented and dedicated group of American patriots." I can't believe my book is finally coming out. Pre orders are available at Hellgate Press. I am proud to announce Camera Boy: An Army Journalist's War in Iraq is available for pre order. Be one of the first people to own it and get it a month before bookstores.